Tired of boring bagels and cream cheese for the office breakfast? In November, I learned about Farm 2 Tacos and am bewildered that it has taken me so long to blog about this brilliant concept. Delivery breakfast tacos! 30 tacos for approximately $150 does seem a bit more expensive than the bagel and CC route, but well worth it. Think of all the protein and veggie goodness! Hopefully I will order these soon and will review them more promptly. 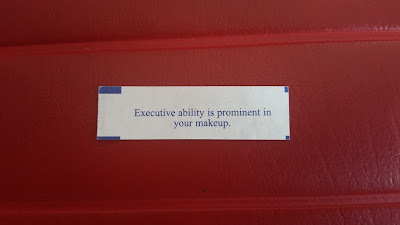 Despite my inability to eat the fortune cookies that come with an order of Chinese food, I love cracking them open and reading the hilarious fortunes bestowed upon me. Every once in a while I receive a fortune that really seems to fit. I slip that little slice of paper into my wallet and occasionally stumble upon it and am reminded of its relevance. In an effort to Marie Kondo my life and throw out all joyless items, I was reaching for my insurance card and decided to clean out my wallet. Why keep these pieces of paper when I can digitize them? So, I did. Sweet. Fortune 500, here I come! Yes. Seize life. Grab onto it. Carpe diem. Brief philosophical diatribe on fortune cookies. Have you ever ordered one entree, one appetizer, and one side for yourself knowing that you'll have leftovers and receive 18 fortune cookies? This is either a generous gift from the person that packaged your meal, or a subtle hint that maybe you have enough food to feed an army. I prefer the former.